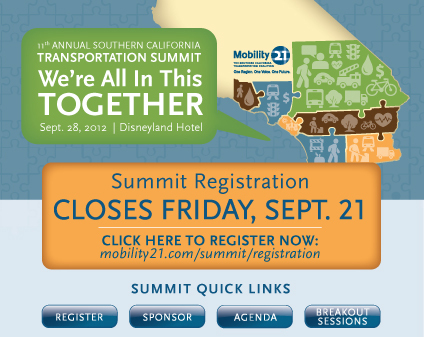 Join more than 80 businesses in supporting Mobility 21’s annual Southern California Transportation Summit on Friday, Sept. 28 at the Disneyland Hotel. 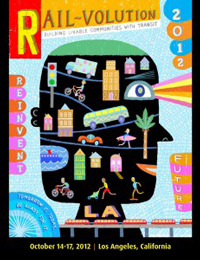 Join us from Oct. 14-17 in Los Angeles for Rail~Volution 2012 and see how Los Angeles is putting a retro spin on tomorrow. 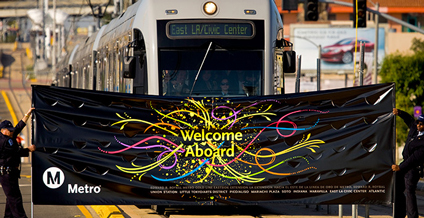 People from all perspectives will be energized by a mix of ideas, cultures and transit projects unique to the Los Angeles region. Join the above sponsors in supporting transit, livability and healthy communities in our region. Click here to read more about the sponsorship opportunities. 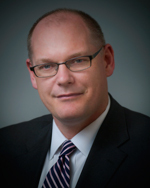 This month, California Business, Transportation and Housing Agency Acting Secretary Brian Kelly shares the latest transportation news from Sacramento. M21: What is the administration’s plan to advance public-private partnerships, design-build and other innovative project delivery tools? BK: California has opened the door to transportation public-private partnerships in a limited way to understand more fully whether this model can be effective for future projects. By undertaking important public-private partnership projects such as the Doyle Drive project in San Francisco, California will be better positioned to assess the cost-effectiveness and timeliness of this method of project delivery. M21: Can you tell us a little about Governor Brown’s reorganization plan? Why was it initiated and will transportation be strengthened or weakened under the plan? BK: Transportation will be strengthened under Governor Brown’s transportation reorganization plan, which is to combine Caltrans, the Department of Motor Vehicles, California Highway Patrol, the Office of Traffic Safety, Board of Pilot Commissioners, the High-Speed Rail Authority and the California Transportation Commission into one Transportation Agency. His plan recognizes that in order to meet California’s mobility challenges, we must bring sharper focus to what is the largest and the most complex transportation system in the nation. California faces numerous important policy challenges in the coming years, such as: how to integrate a high-speed rail system into our existing highway and regional transit systems; how to better balance California’s outstanding transportation financial needs with existing resources; and how to better coordinate transportation investments with the location of housing and job centers to achieve more efficient land-use patterns and allow regions to meet their greenhouse gas emission targets. These issues demand cabinet-level attention and focus to achieve the state’s mobility, safety and air quality objectives from its transportation system. M21: With the governor’s recent signature of Senate Bill 1029 to appropriate $4.7 billion for the first segment of high-speed rail and connectivity improvements across the state, what does the future hold for high-speed rail and existing commuter rail systems? How will Californians benefit? BK: Sometime early in 2013, California will break ground on the nation’s first high-speed rail system. By signing Senate Bill 1029, Governor Brown appropriated $4.7 billion to begin a high-speed rail system and also make mobility improvements to regional transit systems. This state money will leverage another $7.9 billion in federal and other funds. Californians will not only benefit from the jobs and economic activity that this level of investment brings into Southern California, the Central Valley and the Bay Area, they will also benefit by the mobility and operational improvements to California’s larger transportation network. Ultimately, when the entire system is complete, Californians will enjoy increased access to a faster, better and cleaner transportation system. M21: What is the governor’s fall ballot initiative and how will it impact transportation? BK: The Governor’s fall ballot measure is a comprehensive effort to restore fiscal stability to California. It asks those who could most afford it to pay a little more – on a temporary basis – to avoid additional cuts to California’s education system. By bringing stability to the state’s fiscal picture, the initiative ensures transportation funds can continue to be used for their intended purpose – the mobility and safety of our traveling public. 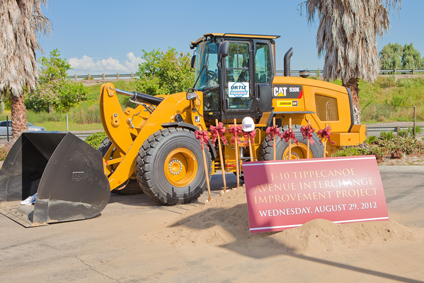 The San Bernardino Associated Governments (SANBAG), California Department of Transportation (Caltrans), and cities of Loma Linda and San Bernardino gathered this month to celebrate the start of construction of the Interstate 10 / Tippecanoe Interchange improvement project. “This project will untangle a traffic knot that has frustrated drivers for years by transforming this junction into a 21st century interchange, and I thank all of our federal, state and local partners for helping to make this major investment in our region’s future possible,” said San Bernardino County Supervisor and SANBAG President Janice Rutherford. This two-phase construction effort will ultimately widen the eastbound off-ramp to a two-lane exit, expanding to four lanes at the intersection, add an eastbound auxiliary lane for better access on and off the freeway, construct a new westbound off-ramp and add a new westbound loop on-ramp to eliminate the need for left-hand turns for access to I-10. This long-awaited overhaul of one of the busiest interchanges in the valley will reduce local street congestion, improve access to medical, retail, commercial, and residential destinations, increase throughput on the local streets and improve the operation of I-10. 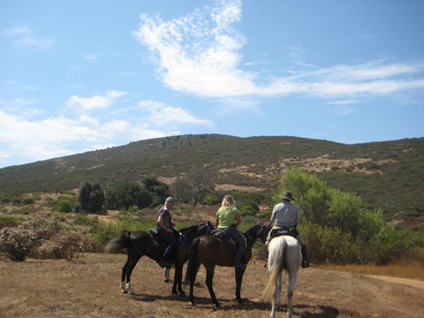 In June the San Diego Association of Governments partnered with the Nature Conservancy and the federal government to acquire the 1,905-acre Hidden Valley property in East San Diego County to satisfy environmental mitigation requirements for a host of transportation improvements. In the transportation world, one of the biggest challenges to building transit or road improvements is fulfilling environmental mitigation requirements. The San Diego Association of Governments (SANDAG), one of the largest metropolitan planning organizations in California, has found a way to meet mitigation requirements in a comprehensive and cost-effective manner. Since launching the TransNet Environmental Mitigation Program (EMP) in 2008, SANDAG has spent nearly $100 million to preserve more than 3,300 acres of valuable habitat and protect endangered species, such as the least Bell’s vireo and California gnatcatcher. Earlier this year, the SANDAG EMP won the Best Practices Award from the San Diego Chapter of the American Planning Association. Emblematic of its success, SANDAG recently partnered with the Nature Conservancy and the U.S. Department of the Interior to buy a 1,905-acre property to mitigate the effects of numerous regional transportation improvements. Had SANDAG bought the land piecemeal to meet mitigation requirements, it would have cost an estimated $58 million. By teaming up with public and private partners, it saved taxpayers $48 million. The EMP is made possible by TransNet, a half-cent sales tax for transportation approved by San Diego County voters. TransNet sets aside $850 million over 40 years to buy land, restore habitat and monitor wildlife as offsets to disturbances caused by transportation projects. This stable revenue stream has enabled SANDAG to purchase land in larger parcels and at lower costs in advance of projects. At a time when conservation funding is scarce due to the recession, SANDAG is able to take advantage of the buyer’s market to acquire land at favorable prices. Under the EMP, land purchases are done strategically according to goals set in regional habitat conservation plans. Often purchases leverage funding from acquisition partners, and the acquired land combines with open space preserved by other agencies to create continuous wildlife corridors spanning thousands of acres. For example, the most recent acquisition, known as the Hidden Valley property, augments the San Diego National Wildlife Refuge managed by the U.S. Fish and Wildlife Service. The acquisition fills in missing links between the Wildlife Refuge and the state-owned Rancho Jamul Ecological Reserve. Aside from open space acquisitions, the EMP supports scientific research, and regional collaboration on land management, joint use of resources and funding strategies. Following massive wildfires that burned more than 600,000 acres in San Diego County in 2003 and 2007, the program funded efforts to restore damaged habitat and assess the level of recovery. With support from the EMP, the U.S. Geological Survey in 2011 finished a five-year evaluation that found neither the coastal sage scrub nor the chaparral habitat has fully recovered. The findings helped to raise awareness of lost biodiversity, and the importance of proactively planning for recovery after wildfires. Other efforts funded by the EMP include: the installation of steel barriers to keep illegal off-road vehicles from infringing on vernal pools; mapping of the dwindling cactus patches used as habitat by the California cactus wren; removal of exotic weeds from endangered species habitat; and field research on the Thorne’s hairstreak and Hermes copper butterflies to determine whether they should be listed as endangered species. Through the EMP Working Group, SANDAG coordinates with local, state, and federal agencies, as well as nonprofit groups, to manage, monitor, and acquire land. All the expenditures related to the EMP are overseen by an independent taxpayer oversight committee to ensure fiscal accountability. To learn more about the EMP, visit KeepSanDiegoMoving.com. 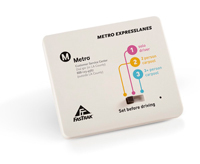 All Automobile Club of Southern California branches are offering Metro ExpressLane transponders at a 20 percent discount exclusively for Auto Club members. Currently, Auto Club branches are the only retail locations outside of Metro customer centers where the transponders can be obtained. Existing and expanded carpool lanes will become ExpressLanes open to both toll-paying solo drivers and carpoolers on the Harbor Freeway (Interstate 110) later this year and along Interstate 10 in East Los Angeles next year. All drivers, whether driving alone or in a carpool, will be required to have a transponder to use the Metro ExpressLanes. FasTrak transponders obtained at Auto Club branches will have $40 in preloaded toll credit, but members will be charged just $32. Auto Club members can also acquire transponders online and receive the AAA discount by visiting http://AAA.com/metroexpresslanes. Drivers must activate their transponders after purchase by establishing accounts with Metro. “We hope that opening the I-110 and I-10 carpool lanes to toll-paying solo drivers will provide a new option and improve congested traffic conditions for everyone,” Finnegan added. The FasTrak transponders available at Auto Club branches can be used for automatic toll payments on all toll roads and express lanes in California, including the 91 Express Lanes and toll roads in Orange and San Diego counties. This program will enable solo drivers to ride on parts of the former I-110 and I-10 carpool-only lanes by paying a variable toll between 25 cents and $1.40 per mile, depending on the traffic congestion in the lanes. Toll rates in other counties differ. Carpool drivers will not be charged tolls to use the Metro ExpressLanes. AECOM provided key services on the Metro Gold Line Eastside Extension in Los Angeles. AECOM is a proud sponsor of the 2012 Mobility 21 Summit. As a key driver in advancing transportation initiatives throughout Southern California, AECOM recognizes the importance of having a unified voice for the region’s transportation priorities and efforts to improve mobility. AECOM is a global provider of professional technical and management support services to a broad range of markets, including transportation, facilities, environment, energy, water and government. With approximately 45,000 employees worldwide, AECOM is a leader in the key markets that it serves. AECOM provides a blend of global reach, local knowledge, innovation and technical excellence in delivering solutions that create, enhance and sustain the world’s built, natural and social environments. As a Fortune 500 company based in Los Angeles, AECOM has influenced the development of key projects in the community, such as the Metro Gold Line Eastside Extension that links Union Station to East Los Angeles, bringing new transit options to the area. In addition, AECOM’s work helped alleviate congestion along I-10 and I-110 with Metro ExpressLanes, the first conversion of high-occupancy vehicle lanes to toll lanes. AECOM also designed and managed services for new facilities at the 484-acre Maersk Pier 400 at the Port of Los Angeles. UPS proudly sponsors the Mobility 21 conference and its mission to improve regional transportation. The collaboration supports innovative ideas that benefit the environment, economy and quality of life. Moving 14 million packages around the world each day requires a large fleet, and UPS invests in a variety of low-emission and fuel-efficient aircraft and vehicles to reduce its carbon footprint. 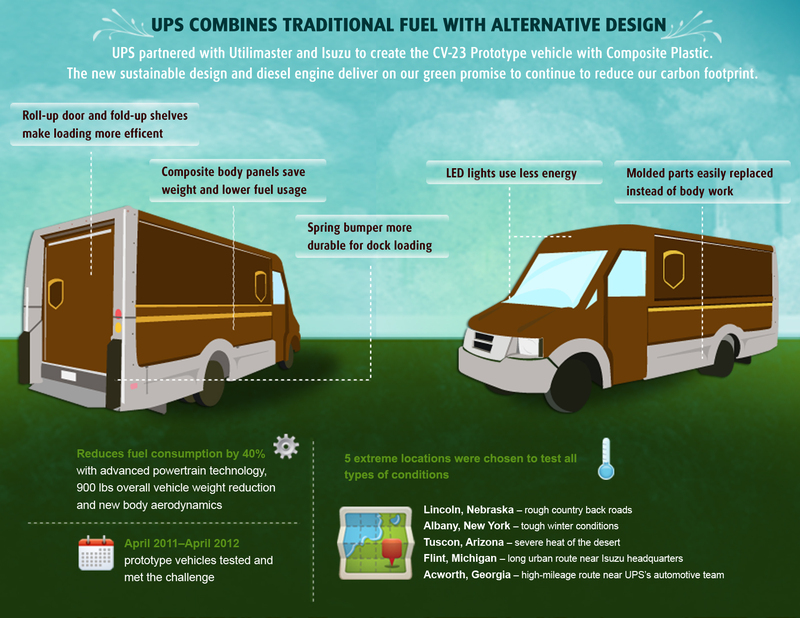 Last year, UPS increased its alternative fuel fleet by 35 percent; eliminated 98 million minutes of idling time which equals 657,000 gallons of gas; and introduced the new “Plastic Truck”. These plastic composite vehicles shed 900 pounds, saving 40 percent in fuel. Trials showed they work well in all climate types, are easily repairable and maintain high safety standards. UPS also purchased 48 heavy tractor trucks that run on Liquefied Natural Gas (LNG). The vehicles produce 25 percent fewer greenhouse gas emissions compared to the older trucks and use 95 percent less diesel fuel than the diesel vehicles they replace. The LNG tractors travel along a transit lane linking Ontario, California and Las Vegas. Delivery technologies are only half the journey to more sustainable logistics. Services such as UPS My Choice® provide consumers with more flexible delivery options, reducing the number of delivery attempts which saves fuel and time. UPS’s carbon neutral shipping program has been adopted by many California-based companies including Anderson Seafoods who uses it to supplement its sustainable fisheries program. UPS collects minimal fees from participants and purchases carbon dioxide (CO2) offsets to minimize the impact of the shipments. The funds are then used to support certified environmentally responsible projects around the world including California’s Garcia River Project. To learn more about UPS’s sustainability efforts, please visit http://www.ups.com/sustainability. The California Construction and Industrial Materials Association (CalCIMA) 2012 Annual Education Conference provides educational, business and networking opportunities for the construction materials, ready-mixed concrete and industrial minerals industries. This year’s annual conference, Embracing the Future, will focus on ideas to enhance and revitalize business prospects as we come out of the recession. The educational conference will highlight ideas, such as public-private partnerships and how they can bolster infrastructure funding and projects. Additionally, the conference attendees will discuss business opportunities for the construction and industrial materials industries associated with California’s High-Speed Rail project. The conference also includes breakout sessions, exhibits and a golf tournament. Those engaged in the business of construction or industrial materials are encouraged to attend. Register now! The Self-Help Counties Coalition presents the 23rd Annual Focus on the Future Conference at the Marriott Hotel in Newport Beach from Nov. 11-13. The Focus on the Future conference provides a forum for self-help counties and other transportation agencies, elected officials and the private sector to share experiences, highlight upcoming projects and interact in a relaxed environment. The conference continues to be a premier transportation conference in California with over 600 people in attendance and growing. Click here for more information.